In a large bowl, combine the chopped apples and sliced bananas. Add the lemon juice and toss together well. Add the remaining ingredients and gently toss well to coat. Cover and refrigerate until serving time. 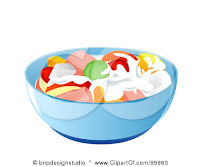 This clipart used for reference only.